Cat and Mr. Henry have set the date for their wedding-Christmas Day! 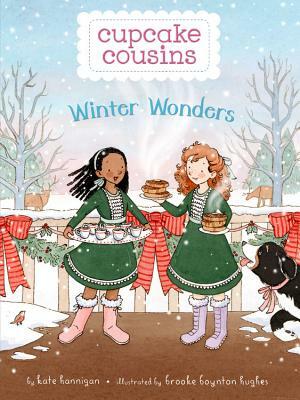 Cousins Willow and Delia are excited to be junior bridesmaids at last, but when a record-breaking Christmas Eve blizzard leaves the whole town stranded, the girls have more to worry about than their wedding duties! The guests are late, and the roof has collapsed over the town's food pantry, leaving many without a holiday meal. Will Delia and Willow be able to help the town's hungry while giving Cat and Mr. Henry the wedding they've dreamed of? Tasty recipes are included throughout as the whole Bumpus family celebrates the true meaning of the holiday season in the final book of the Cupcake Cousins series. Kate Hannigan loves to test new recipes on her husband, three kids, and even the family dog. When she's not creating disasters in her Chicago kitchen, she's usually at her desk writing fiction and non-fiction for young readers. Kate is also the author of Cupcake Cousins, Cupcake Cousins: Summer Showers, and The Detective's Assistant. Say hello online at katehannigan.com. Brooke Boynton Hughes grew up in Loveland, Colorado, where she spent lots of time drawing cats, mermaids, and tree houses. Today, she lives in Washington and holds a BFA in Printmaking from Colorado State University and an MFA in Figurative Art from the New York Academy of Art. Brooke is also the illustrator of Cupcake Cousins, Cupcake Cousins: Summer Showers, Baby Love, and Henry Wants More! Visit her online at brookeboyntonhughes.com!